The 2-3 zone defense is the most commonly used zone defense, designed to stop the inside game. Good outside shooting can rip this zone apart. But you still need to get the ball inside, especially late in the game, or when your shooters are not hitting. Presented here are clinic notes from Bill Self, Kansas head coach, discussing several plays designed for attacking the zone. Also see "Kansas Zone Offense". 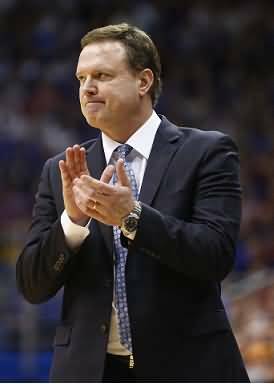 Coach Self usually starts his 2-3 zone offense and plays with a 3-out, 2-in set with both post players low. Here we actually start with O5 at the high post. In the diagram A below, O1 passes to O3 and cuts around O5 and through to the opposite corner. O5 steps out and gets the pass from O3 (diagram B). O5 passes to O2, and O2 passes to O1 in the corner. O5 cuts to the ballside elbow and could get the pass here from O1. If so, O5 looks to pass inside to O4 who seals off the low defender. Optionally, O1 could pass to O4 on the block. When this happens, O5 dives across the lane to the weakside block, looking for a pass from O4 and the inside shot (diagram C). O1 dribbles toward the right wing and O2 slides down to the corner and receives the pass there from O1 (diagram A). The outside low zone defender will come out to defend O2. Next O2 skip-passes to O3 on the opposite wing (diagram B), and O4 cuts to the ballside elbow and occupies the middle zone defender. The skip-pass to O3 should get the left outside low defender to "lift" (come out to defend O3). O5 screens the remaining low zone defender who was guarding O2, and O2 cuts around the screen for the pass inside from O3. This could be a weakside lob pass and dunk for big college teams, or a pass to O2 cutting to the ballside block for smaller teams. O1 passes to O2 (diagram A below), and O5 flashes to the ballside elbow, and occupies the middle zone defender. O3 drops inside, getting ready to set his/her screen. O2 passes back to O1, as O3 screens the low defender for O4. O4 cuts to the left side for the quick pass from O1. It's important to notice that O1 aligns on left lane line-extended to have a good passing angle. O1 passes to O3 and cuts through to the ballside corner (diagram A below). O3 passes to O1 in the corner, and this will get the outside low zone defender to come out and guard O1. Meanwhile, O5 screens the middle low defender and O4 cuts to the ballside for the pass from O1 and the lay-up. Optionally, O1 could skip-pass to O2 who is also often wide-open for the 3-point shot. Get more Kansas Zone Plays in the Premium Members section and the Playbook download. It also includes Play #5, Play #6 (Self calls this the "best zone play ever"), and Play #7.